In 3 Point Challenge, located in the Kissing Tower Hill℠ area, players take 12 shots in 45 seconds. Players must take 4 shots each from 3 designated locations around the basketball court. 1 point is earned for each brown basketball made and 2 points are earned for each green basketball made. 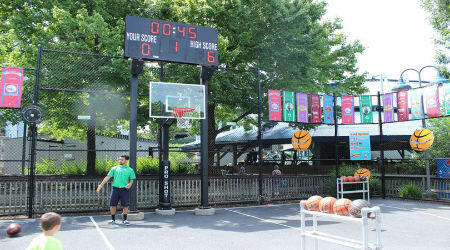 Players that score at least 4 points will win a prize.